Now THIS is how you spice up a training video. It’s clear from this batch of training sessions from the ’80s that Wendy’s was looking to cut through the drone-ish humdrum of the usual employee on-boarding process, and in that effort they absolutely succeeded. Whether that translated to better retention or employee knowledge is probably debatable, but I’m willing to bet that every employee who trained up through these videos remembers them. Fondly? Who knows. We’ve got three videos aimed at teaching employees how to serve drinks, and all three are pretty different approaches. Well, sort of; they all have one thing in common in that they’re all music videos. They’re all really gaudymusic videos. That’s where the similarities end, though, as each video leans into the directions that the drinks featured in the video would probably demand. “Hot Drinks” is an upbeat show-tune-y rap filled with synth horns, strings, and verses that stretch their measures to squeeze in the necessary training info. In the neon-lit club or restaurant or whatever it is, our protagonist singer twists and scoots his way through the steps required to serve tea, coffee and cocoa. This one’s the earworm of the bunch. Wendy’s appropriately dials the tone down for “Cold Drinks”, in which a sultry employee against a white backdrop breathily explains how to fill a cup with varying ice levels depending on the drink being served. That’s about the extent of the tips here. Oh, and not to overfill or underfill the drinks, that’s important. She does a vocal break in the middle that’s pretty impressive while a disembodied baritone voice reminds us not to forget to smile while we serve cold drinks. Lastly there’s this headscratcher, a tune called “Got To Serve The Drinks.” It couldn’t be less about serving drinks and offers no real actionable training tips, instead focusing on things like smiling and keeping the counters clean. As someone who’s gone this far down the drinks training rabbit hole, it’s a bit disappointing to land here. The song is grating as well, but it’s nice to see some familiar faces from the other videos. I’ve written about this one before, but it bears a mention here. The magnum opus of the Wendy’s Training regimen is “Grill Skills”, a video obviously produced by the same team who made the drinks set, where a trainee named Bill gets sucked into a training video and is taught how to make hamburgers by a rapper. This is the “Magic Bullet” of training videos, the gold standard; nothing that I’ve found before or since has come close. There’s something very special in how deliberate and consistent the approach is across these videos. 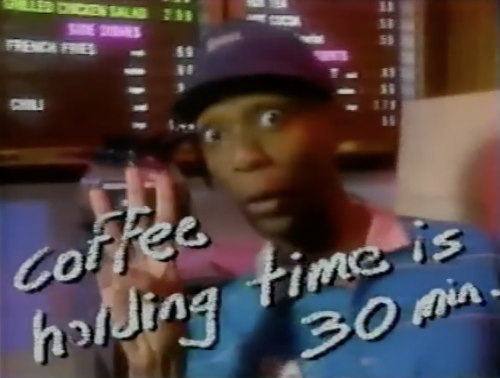 It’s a neat reflection of not just the cultural aesthetic of the ’80s and ’90s but that era’s belief in these overproduced corporate videos as effective training tools. It’s lighthearted and goofy but not really making fun of itself, a really delicate path to walk, and in that it’s a feat.